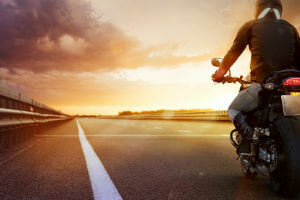 If you own or frequently travel on a motorcycle, you should be aware of the laws Oklahoma has enacted to ensure the safety of motorcycle operators. These laws are designed to prevent serious injuries or fatalities from occurring. If you or someone you love was injured in a motorcycle accident in Oklahoma, contact the Edwards Law Firm for experienced legal help. In order to legally operate a motorcycle in Oklahoma, you must have an “M” endorsement on your state-issued driver’s license. You must be 14 years old to obtain a motorcycle-only license or 16 years old to earn a motorcycle endorsement. You must earn a motorcycle learner’s permit by passing a written and vision-based test. Once you have earned a permit, you will need to be supervised while operating a motorcycle by another individual who is licensed to operate a motorcycle for a 30-day period. Applicants under the age of 18 must sign up for an approved motorcycle education course. If you complete the course, you are not required to take the road skills exam to acquire a license. Passing an on-road skills exam. If a motorcycle education course was not passed, an on-road skills exam must be passed. If your out-of-state motorcycle license has been expired for more than six months, a written and road motorcycle test must be passed to obtain Oklahoma licensing. For a qualified Oklahoma motorcycle accident lawyer, contact our team today. Oklahoma requires motorcycle operators to have gear and equipment that offers ample protection and ensures their safety when riding on the state’s roadways. Two rearview mirrors, both three inches in diameter, mounted on each side of the motorcycle and positioned in such a way that you can clearly see the roadway to the rear of the vehicle. A windshield of sufficient quality, size and thickness that protects you from foreign objects. If you do not have a windshield, you must wear goggles or other forms of protective eyewear, or a face shield designed to protect you from foreign objects. A fender over each wheel. A horn that properly warns others of your presence. A muffler or other noise-suppressing device. Handlebars that are no higher than eye level. In Oklahoma, riders and operators who are over the age of 18 have a choice to wear a helmet when traveling on a motorcycle and are not required by law to do so. However, any person who operates or rides a motorcycle and is under the age of 18 is required by law to wear a helmet. Although Oklahoma does not require adults to wear a helmet while traveling on a motorcycle, it is highly recommended for your safety that you do so. In 2013, 61 of the 92 people who died in motorcycle accidents in Oklahoma were not wearing a helmet, according to the Oklahoma Highway Safety Office. Oklahoma also utilizes the rule of comparative negligence when determining fault in a motorcycle accident case. This means the level of fault you had in causing your own injuries will reduce the damages you can recover from your claim. If a court finds that you neglected to wear a helmet and were injured in a motorcycle accident, you could be considered partially at fault for your injury. Lane splitting occurs when a motorcycle operator rides between lanes or rows of slow moving or halted traffic moving in the same direction. Under Title 47 O.S. § 12-609, motorcycle operators are not allowed to pass other vehicles between lanes of traffic or perform any action or maneuver similar to lane splitting. A motorcycle operator who is over the age of 16 is legally allowed to carry passengers on his or her vehicle. However, according to Oklahoma law, any person under the age of 18 must wear a helmet. If you and your vehicle meet the requirements enforced by Oklahoma law, you are legally allowed to have a passenger on your motorcycle. Motorcycles, like every other vehicle, must be insured in order to be legally operated in Oklahoma. Once you have acquired the minimum insurance required by Oklahoma, you are allowed to obtain a motorcycle endorsement and receive your license. Although motorcycles offer riders an open and enjoyable experience, the vehicle is often susceptible to severe collisions, often due to the negligence of the other driver. The Tulsa motorcycle accident attorneys at the Edwards Law Firm might be able to help you take legal action and pursue damage from the at-fault party after a serious motorcycle crash. We will discuss your accident during a free, no-obligation consultation. Our attorneys will review the events that occurred before and during the accident and will be able to determine if you have a case against the other party involved. Do not hesitate to contact us as soon as you are able to. We require no upfront payments for our services and will only charge you if we recover damages for your claim. Contact us today.